Clean facia’s really make a difference to how a building looks! Take a look at these images of facia’s and gutters that have been cleaned by DMC window cleaning using a water fed pole and pure water. 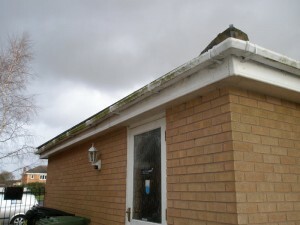 Before cleaning they had accumulated green algae due to a blocked gutter system causing the discolouration to the plastics. After short time they were transformed from this image to the one below. It looks as good as new after a clean and improves the look of the property instantly! If you have similar problems with your property then DMC window cleaning are just a call away to do the same for you. 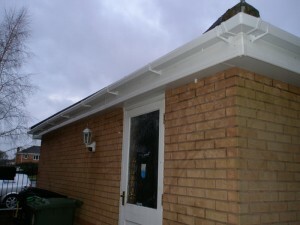 Call us on 07545 149197 (Daytime) or 01905 770854 (Evenings) for a free quotation to clean your facia and gutter system. A free demo can be done to show you how it will look. Started window cleaning in the winter of 2006 after deciding to quit my managers job at a well known retailer in the UK. In 2010 decided to get a professional qualification in window cleaning and training in the modern methods of water fed pole cleaning.I have an IOSH certificate in H&S. Working for yourself has pros and cons but for me it was the best choice, I enjoy it! A professional window cleaning service dedicated to safety, quality and customer satisfaction. You can now pay your bill online using Paypal. You do not need a PayPal account to use this feature. Improve the view of your home. Conservatory roof cleaning makes a difference! DMC Window Cleaning has a new recruit! Commercial cladding cleaning in Worcestershire. Puppy Tales! ‘Gus’ has been growing! Copyright DMC Window Cleaning. All Rights Reserved.